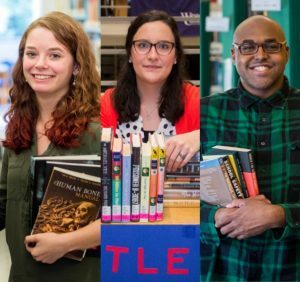 Kristen Cook of Kinston, N.C., and Lorraine “Rainey” Kelly of Deep Run, N.C., were named Hunter Library’s outstanding student workers for the 2017-2018 academic year. Cody Pearsall of Greensboro, N.C., was nominated by his supervisors for WCU’s Student Worker of the Year award, a university-wide competition. The award winner has the opportunity to compete at regional and national levels. Pearsall, a social work major, plans to attend graduate school after receiving his undergraduate degree. His supervisors agree that he has an amazing attitude one wishes to see in all their employees. “No matter the task, whether he is helping patrons at the circulation desk or moving collections and furniture, Cody maintains a positive attitude,” Finegan says.